“Mario Woods and his execution by firing squad was just on hush,” Miles Muhammad said. “In two months, the biggest Superbowl in NFL history was coming to the San Francisco Bay Area. It could not have that type of controversial incident, murder, involving five out of nine to 10 police who discharged their weapon on a 26-year-old Black male with a knife. They could not have that on national news daily,” he and other activists argued. San Francisco police officers Winston Seto, Antonio Santos, Charles August, Nicholas Cuevas and Scott Phillips shot Mr. Woods 20 times execution-style after surrounding him on Dec. 2, 2015. Police claimed Mr. Woods, who was accused of an assault, approached them with a knife in his hand, causing them to open fire. Footage of the ordeal captured on cell video cameras showed they riddled his body with bullets while his hands were at his sides and his back up against a wall. Shortly after the tragedy, Miles Muhammad reached out to James Muhammad a.k.a., “James Bomb” of the legendary and pioneering rap group Public Enemy, which has been at the forefront of addressing important social justice issues through their music. “The world needs to know what happened to Mario Woods, and that’s how it all started,” Miles Muhammad said. 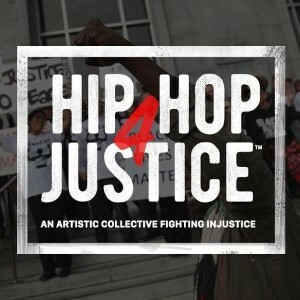 He and others contacted artists, executives, bloggers and radio show hosts to alert them to the Woods tragedy and as a result, Hip Hop 4 Justice, “An Artistic Collective Fighting Injustice,” was born. Those involved have sustained a national, weekly conference call for over one year now. The call features a report on work by the Justice for Mario Woods Coalition by Student Minister Christopher Muhammad of Muhammad Mosque No. 26 in San Francisco who also gives the group guidance from the Honorable Minister Louis Farrakhan. One call consisted of up to 75 artists and influential members of the Hip Hop community, according to Miles Muhammad. Left to right: Miles Muhammad (MosqueNo. 26) and James Muhammad a.k.a James Bomb (Public Enemy). The group has also released a free mix tape featuring legends including, Public Enemy, Whodini, Mellow Man Ace, Carmelo Alvarez (The Legendary Radiotron), KAM, Michael Khalfani aka Disco Daddy, Poor Righteous Teachers, Da Lenchmob, RBX, PARIS, Daddy-O, Kangol Kid, DJ Chuck ChillOut, Freedom Williams, Doitall, DJ BattleCat, Cli-N-Tel (World Class Wreckin’ Cru), 1/2 Pint of Son of Bezerk, DJ Silky D (Uncle Jamz Army), Genesis Omega, and more. “Movement Music: A Tribute 2 The Martyrs” 14-track mix tape available at www.HipHop4Justice.org and under the hash tags #Justice4MarioWoods and #MovementMusic is a prelude to a multi-volume compilation project, according to organizers. James Muhammad said he was horrified by footage of the Woods shooting, which he took personal. “My youngest brother got shot down by the police in Florida in ‘92, so it took on a different meaning to me each time I looked at the video,” he said. “It was literally, according to how the Honorable Minister Louis Farrakhan said, a hate crime. It was like White folks and their dogs. They don’t treat animals that way, but he was shot down like he was nothing, like he was an animal in a field or something that they were just discarding, and when I saw that, then it was like okay, it’s time to take action. It’s time to do something. This gotta stop,” he emphasized. James Muhammad then alerted Public Enemy front man, Chuck D who became involved in the movement. 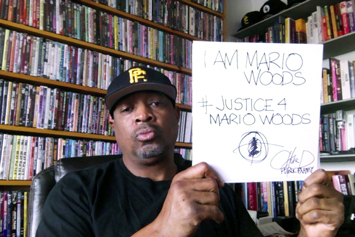 “It was the thought that the community’s voice, Hip Hop, could stand up as a unified voice to speak out against not only the atrocity of Mario Woods, but to the industries that prevail in the United States and around the world,” said Chuck D.
“The weekly phone call speaks to the issue, but also, is able to address a lot of other things that are going on, which will bring up the antennas, but also give purpose to the rhymes and the reasons,” Chuck D told The Final Call. He said Hip Hop 4 Justice movement is similar in scope to Prophets of Rage (a combination of three groups that challenge the perception of society through Hip Hop, Rap and Rock Music) because both work from the premise that the world won’t fix itself. “Thinking the world is going to fix itself is just like walking past a piece of paper on your lawn, and thinking somehow, it’s going to find itself to the trash can. I mean, it don’t work that way,” said Chuck D.
“This is a different day, where artists have got the use of technology and themselves and they have their ability to write words and this is a great rhyme and reason for them to call to the change of what we see as one-sided,” he continued. He urged the community to support efforts of the movement’s rap artists and singers, and have their backs as they fight. Freedom Williams joined Hip Hop 4 Justice after making a song for 25-year-old Freddie Gray, who died with an almost completely severed spine while in police custody in April 2015 in Baltimore. 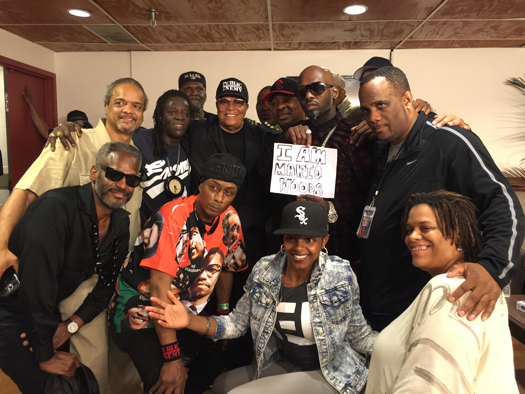 He shared the song with a publicist who recommended it for the Hip Hop 4 Justice soundtrack. 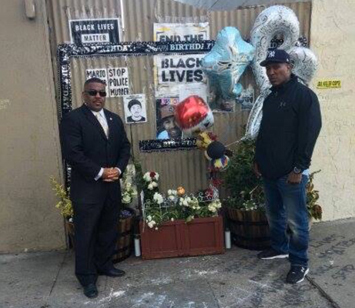 Hip Hop 4 Justice means protecting the family,” Mr. Williams said. “Culture is your greatest weapon. The Minister (Louis Farrakhan) always says that our athletes, our singers, our ball players are our natural resources,” he stated. Genesis Omega joined Hip Hop 4 Justice and the Justice for Mario Woods Coalition because of her son who was seven at the time Mr. Woods was killed. “I couldn’t fathom losing my son to a situation like that, and I know how the judicial system is, so I took it as a personal reason to want to join,” she stated. She said the artists’ participation on the project means a lot because today’s artists generally have become selfish, but they have so much power and influence, she said. “They don’t realize how much influence and the great impact that they have on young people today, so I think it’s just a great thing that they stepped up to the plate,” Genesis Omega stated. As the artists raise awareness through their mix tape, the coalition continues to press for charges against the officers. Gwen Woods, Mario’s mother, has filed a federal civil rights wrongful death lawsuit. The San Francisco City Attorney’s Office said the cops acted lawfully, and the District Attorney’s office has not filed charges against any of them. Depositions have not yet begun in the civil rights lawsuit but the case is moving along, said family attorney John Burris. “The District Attorney’s Office has taken a lot of criticism, rightfully so, for not having made a decision about it. I have to tell you given the length of time they’re taking, I’m not optimistic that charges will be brought,” Atty. Burris told The Final Call. The Justice for Mario Woods Coalition forced the resignation of police chief Greg Suhr, and began the formation of a recall committee to get rid of the District Attorney, said Student Minister Christopher Muhammad. “That’s our next goal, because he refuses to do what he has the power to do, which is charge these officers. We are going to attempt to pull him down from his post. If he continues not to do the right thing, then we are going to pull him down as a sign to others, he said. “The Honorable Minister Louis Farrakhan made a statement some years back, ‘Let the cultural revolution begin.’ So it’s critical that the artists, the playwrights, the spoken word artists, the writers, the actors, the singers, all begin to recognize their power of influence and education of our people in the liberation struggle,” Student Minister Christopher Muhammad said. He added that he is proud of the coalition and is grateful for the artists who are leading the movement of Hip Hop 4 Justice. He believes the impact of their profound, powerful album will be felt for years to come. He also expressed gratitude to Alicia Keys, who used her platform during a past Superbowl to speak out, and, to Beyoncé and her dancers for standing with the coalition. “They used to say we’re keeping it real by talking about drugs and pimping and hustling, but they’re not keeping it real when it comes to police misconduct, police brutality, or all of the plots to destroy our people, keeping it real about prison industrial complex, keeping it real about those things that cause our people to be destroyed by the system-education, the system of justice, so we’re asking our artists, keep it real with that,” said Student Minister Christopher Muhammad.